Pantone announced their color of the year for 2019 this morning. Unfortunately, it's kind of hard one for men to incorporate, I'd say. Living Coral is a 1960's looking, orange/hot pink to me. I work in a design related field where it's a little bit of a tradition to try to incorporate these colors into clothes in small ways. Anyone wearing anything in coral? 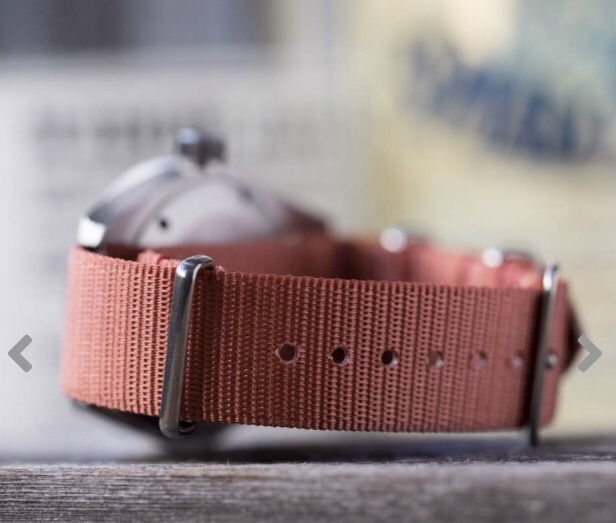 I’m pretty sure this nato strap is currently in my Xmas stocking. Is that close enough to be on trend this year? Funny, they're changing the colors at the office I work in and coral is definitely a major theme of it. In terms of clothing, anyways, can't say I'm a huge fan of that color in most items but it might work as a minor color in socks, ties, or pocket squares. I think the color of the year 2018 is supposed to be ultra violet (purple), although I honestly cant recall seeing that much of it through the year? To me coral is a distinctly spring/summer color. I could imagine picking up a pair of washed chinos in this color in a few months, but it's hard to imagine working this one into my winter wardrobe. I heard about this on the radio while I was showering this morning. I had a salmon colored oxford from the Gap that I used to wear years ago, that resembles this color somewhat. I agree with LBD that is is mostly a seasonal color and would work best for Spring/Summer. I dont mind the color at all and it will fit in easily with the other colors that get worn in New England in the Summer. Cape Cod red has some competition in 2019! If the linked article is to be believed, this color choice is mostly a political statement. It'd be easy for me to wear chinos or shorts of that color in warmer weather away from the office, or perhaps on a few summer Fridays. A tie in that color would work with a plain white or very light blue OCBD. A cloth belt of that color would look good with very light-colored chinos or shorts. But I peacock a little with color, used to "summer on the Vineyard", etc. YMMV. It's not that strange a colour. Generally you could treat it like pink. Funny thing I was reminded of recently: until the 1950s and Mamie Eisenhower's term as First Lady, pink was considered too aggressive for girls in Western cultures (thus why Penn State's athletic colors were originally pink and black, though they soon discovered 1890s pink dye faded quickly to white). Blue, particularly given its association with the Virgin Mother, was the calm, soothing, feminine colour appropriate for girls and women.